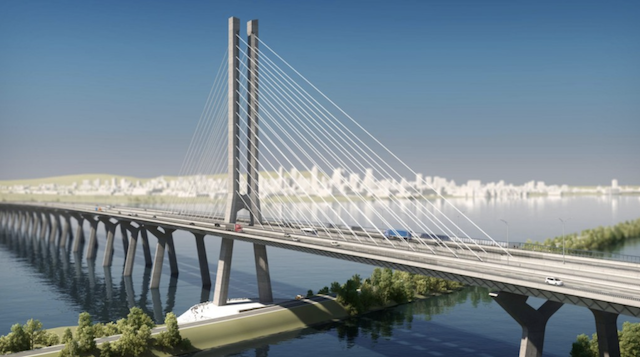 The consortium building the new Champlain Bridge in Montreal says it is aiming to have the structure ready as planned by the end of 2018. The reassurances came Thursday as a published report in Le Journal de Montreal said the new bridge won’t be ready on time and that the current Champlain Bridge will have to be kept in service a while longer. None of the stakeholders would comment directly on the report, but authorities are holding a technical briefing Friday to give an update on the progress of the work. The new structure is being built by the Signature on the Saint Lawrence group, a consortium led by engineering and construction firm SNC-Lavalin. Annie-Claire Fournier, a spokeswoman for the consortium, said a planned opening before Christmas remains in the cards. “What I can tell you from SSL’s perspective is that the objective remains to deliver the bridge in December 2018,” Fournier said. A spokesman for Infrastructure Minister Amarjeet Sohi echoed that objective, adding the federal government had also commissioned a study of how much it would cost to keep the existing 56-year-old bridge open to traffic beyond 2018. The federal bridge authority responsible for operating the current bridge said it would comment at Friday’s update. “Our priority is to deliver a quality bridge as soon as possible without compromising the safety of workers and users,” said Sohi spokesman Brook Simpson. The federally owned structure, a six-kilometre span linking Montreal with its south shore, opened in 1962. It is one of Canada’s busiest bridges and has been deteriorating for years. Last October, the consortium reported several challenges, including transporting oversized prefabricated parts within the province and construction labour woes. To counter that, more workers and shifts were added with the 2018 deadline looming. Again last December, there were assurances from the federal government the $4.2-billion bridge and surrounding corridor would be built within cost and on schedule. At the time, there were reports that some 2,000 defects were found in parts manufactured by a Spanish company. The consortium said the issues were anomalies that ranged from repairs to minor issues and that three-quarters of them had been resolved. A spokesman said 2,500 irregularities were linked to the bridge and another 500 were for the highway portion of the construction. Upon completion of the project, the consortium will maintain and operate the bridge for 30 years.